Keep your classmates and fellow alumni up-to-date with all of the latest milestones in your life. 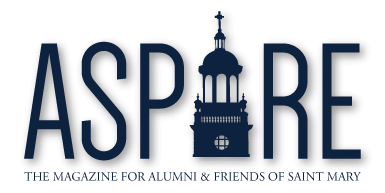 The Aspire is published for the friends and alumni of the University of Saint Mary in print in the spring, summer, and winter, including the honor roll of donors, and in online editions throughout the year by the USM Marketing Department, 4100 South 4th Street, Leavenworth, KS 66048, 913-758-6104. Please send all alumni news items, such as a marriage, birth, death, new job, promotion, award, additiional degree, etc., to the attention of: Alumni Relations, 4100 South 4th Street, Leavenworth, KS 66048, 913-758-6126 or alumni@stmary.edu. Please remember to include your class year, address, and phone number. Copyright © 2015, University of Saint Mary	Blog at WordPress.com.